The great thing about Phlomis is that it adds height to the garden and with its sturdy growth habit Phlomis varieties such as the yellow flowering ‘Edward Bowles’ make an excellent addition to,the cottage garden. Phlomis are mostly a tall ( to 1m) growing perennial fairly drought resistant and hardy. So varieties are shorter growing with the rarely offered pink flowering P. taurica reaching only around 50 cm. Pink purple or yellow flowers in summer and nice green foliage. Seed-heads can give a sculptural effect if left uncut. You can plant most varieties with winter flowering bulbs as it is a plant that that dies right back and does not come to life again until mid spring. P. samia has pink to beige flowers. P. russelliana with its lemon flowers will form a large clump – Also known as Turkish sage..
P. tuberosa ( jerusalem sage) has red stems and pink flowers. P. cashmeriana has lilac flowers. All can be cut back after flowering to promote new growth. 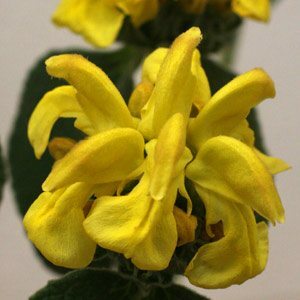 P. fruticosa is also known as ‘Jerusalem Sage’. P. italica has dusty pink lilac flowers. P. taurica – Very attractive pink to mauve flowers through summer, deep green foliage. A little protection from strong winds and frosts and a good humus rich soil is about all most varieties need. Plants can be left with the spent flower heads through winter to add interest. Varieties do differ in growth habit, however most are very easy care and drought tolerant. Flowers – Yellow through to pink depending on variety. Foliage – Deep to mid green. Propagation is easy from cuttings taken in late summer. Clumps can be divided in autumn or in late winter. Phlomis varieties are available for sale from the following nurseries.